Tesla is cutting its board down by more than one-third to seven directors by 2020, a move that includes the loss of some CEO Elon Musk’s early advisers and allies, according to regulator filings posted Friday. The filing comes days before a busy week for Tesla that will include an April 22 event meant to highlight its progress with autonomous vehicle technology, its April 24 quarterly earnings call, and a hearing with a judge to determine whether Musk and the SEC were able to reach a resolution contempt of court request over his Twitter use. In December, Tesla added two independent directors to its board — Oracle founder, chairman and CTO Larry Ellison and Walgreens executive Kathleen Wilson-Thompson. Jurvetson, an early adviser of Musk, just returned this month from a leave of absence from the board. Jurvetson had been on leave from the Tesla and SpaceX since 2017 following his resignation as partner at Draper Fisher Jurvetson amid an investigation into allegations of sexual harassment. Jurvetson has since launched an early-stage venture firm Future Ventures, and recently announced he has raised $200 million for its debut fund. Musk and Tesla settled with the SEC without admitting wrongdoing and Tesla agreed to pay a $20 million fine; Musk had to agree to step down as Tesla chairman for a period of at least three years; the company had to appoint two independent directors to the board; and Tesla was also told to put in place a way to monitor Musk’s statements to the public about the company, including via Twitter. This is a relaxed, Friday, Equity Shot. That means Kate and Alex were on deck to chew through the latest from the IPO front. We’ll keep doing extra episodes as long as we have to, though we’re slightly sorry if we’re becoming a bit much. That’s a joke — we’re not sorry at all. So, three things this week. First, Fastly filed an S-1 (Alex’s notes here); second, Zoom completed its highly anticipated IPO (Kate’s post here, Alex has notes too); and third, Pinterest went public too (more from TechCrunch here). Ultimately, Pinterest’s stock offering valued the company at $12.6 billion (higher than its latest private valuation), but we’ve got some notes on the “undercorn” phenomenon anyway (here and here). Fastly is going public after raising more than $200 million at a valuation greater than $900 million. Founded in 2011, the content-delivery company surpassed the $100 million revenue mark in 2017, growing a little under 40 percent in 2018. It’s an unprofitable shop, but it has a clear path to profitability. And given how Zoom’s IPO went, it’s probably drafting a bit off of market momentum. As mentioned, Zoom had a wildly successful first day of trading. The company ended up pricing its shares above range at $36 apiece, only to debut on the Nasdaq at $65 apiece. Yes, that’s an 81 percent pop, and yes, we were a bit floored. Finally, Pinterest’s debut was solid, leading to a more than 25 percent gain over its above-range IPO price. What’s not to like about that? It’s hard to find fault with the offering. Pinterest got past the negative press and questions about private market valuations, went public, raised a truckload of money and now just has to execute. We’ll be watching. If you’re looking for more Uber IPO content, don’t worry, there’s plenty more of that to come. See ya next week. Malware researcher Marcus Hutchins has pleaded guilty to two counts of creating and selling a powerful banking malware, ending a long and protracted battle with U.S. prosecutors. Hutchins, a British national who goes by the online handle MalwareTech, was arrested in August 2017 as he was due to fly back to the U.K. following the Def Con security conference in Las Vegas. Prosecutors charged Hutchins with his involvement with creating the Kronos banking malware, dating back to 2014. He was later freed on bail. A plea agreement was filed with the Eastern District of Wisconsin, where the case was being heard on Friday. His trial was set to begin later this year. Hutchins agreed to plead guilty to distributing Kronos, a trojan that can be used to steal passwords and credentials from banking websites. In recent years, the trojan has continued to spread. He also agreed to plead guilty to a second count of conspiracy. Hutchins faces up to 10 years in prison. Prosecutors have dropped the remaining charges. His attorney Marcia Hoffman did not immediately return a request for comment. Hutchins rose to prominence after he stopped the spread of the WannaCry ransomware attack in May 2017, months before his arrest. The attack used powerful hacking tools developed by the National Security Agency, which were later leaked, to backdoor thousands of Windows computers and install ransomware. The attack was later attributed to hackers backed by North Korea, knocking U.K. hospitals offline and crippling major companies around the world. By registering a domain name found in the malware’s code, Hutchins stemmed the spread of the infection. He was hailed a hero for stopping the attack. Prior to his release and after, Hutchins gained further praise and respect from the security community for his contributions to the malware-reversing field, and demonstrating his findings so others can learn from his findings. Justice Department spokesperson Nicole Navas declined to comment. Another Silicon Valley company is settling with the SEC: the online lending company Prosper, which the SEC had accused of “miscalculating and materially overstating annualized net returns to retail and other investors.” Prosper has agreed to pay $3 million as part of the settlement, in which it has neither admitted nor denied the agency’s allegations. According to a new release from the SEC: “For almost two years, Prosper told tens of thousands of investors that their returns were higher than they actually were despite warning signs that should have alerted Prosper that it was miscalculating those returns.” The 14-year-old, San Francisco-based company “excluded certain non-performing charged off loans from its calculation of annualized net returns” that it communicated to investors from around July 2015 through May 2017. The mistake owed to a coding error that excluded the defaulted loans from its computations, the SEC said, causing Prosper to overstate its annualized net returns to more than 30,000 investors on individual account pages on its site and in emails soliciting additional investments from investors. The settlement is the second for the SEC in two week’s time. On April 2, the SEC announced that the founder and former chief executive of Jumio has agree to pay the agency $17.4 million to settle charges that he defrauded investors in the mobile payments and identity verification start-up before it went bankrupt. A hacker stole thousands of documents from Mexico’s embassy in Guatemala and posted them online. The hacker, who goes by the online handle @0x55Taylor, tweeted a link to the data earlier this week. The data is no longer available for download after the cloud host pulled the data offline, but the hacker shared the document dump with TechCrunch to verify its contents. The hacker told TechCrunch in a message: “A vulnerable server in Guatemala related to the Mexican embassy was compromised and I downloaded all the documents and databases.” He said he contacted Mexican officials but he was ignored. In previous correspondence with the hacker, he said he tries to report problems and has received bounty payouts for his discoveries. “But when I don’t get a reply, then it’s going public,” he said. More than 4,800 documents were stolen, most of which related to the inner workings of the Mexican embassy in the Guatemalan capital, including its consular activities, such as recognizing births and deaths, dealing with Mexican citizens who have been incarcerated or jailed and the issuing of travel documents. We found more than a thousand highly sensitive identity documents of primarily Mexican citizens and diplomats — including scans of passports, visas, birth certificates and more — but also some Guatemalan citizens. 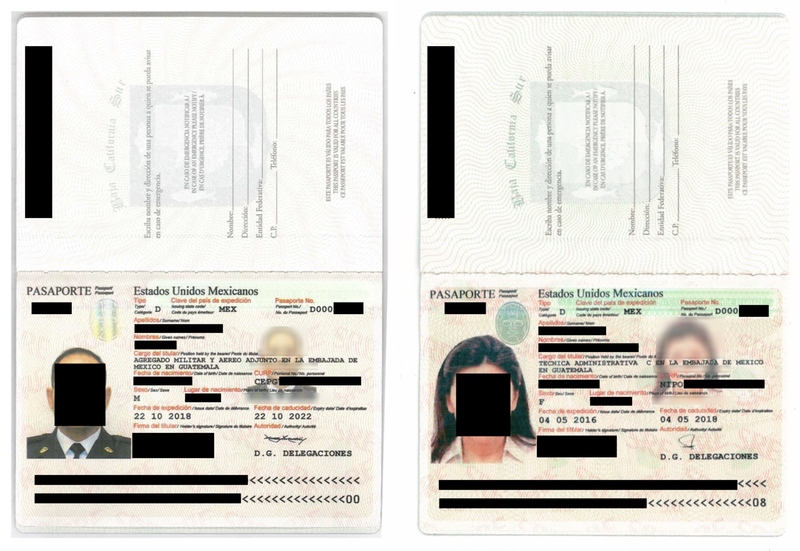 Several documents contained scans of the front and back of payment cards. The stolen data also included dozens of letters granting diplomatic rights, privileges and immunities to embassy staff. Diplomatic rights grant employees of the foreign embassy certain protections from their host country’s government and law enforcement. Diplomatic immunity, for example, allows staff to be granted safe passage in and out of the country and are generally safe from prosecution. 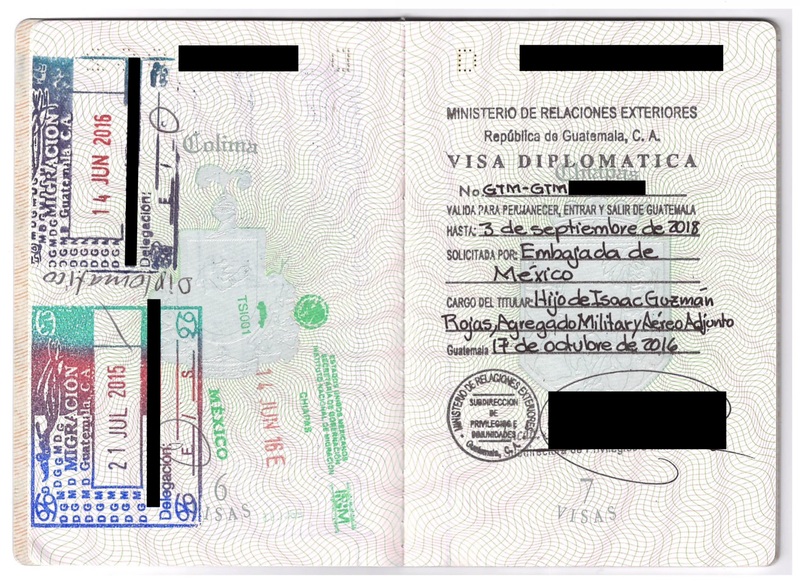 Other documents seen by TechCrunch were signed off personally by Mexico’s ambassador to Guatemala, Luis Manuel López Moreno, and were instructed to be transported by diplomatic bag, which foreign missions use to transport official correspondence between countries that cannot be searched by police or customs. Many of the files were marked “confidential,” though it’s not known if the hacked data included anything considered by the Mexican government to be classified or secret. Other files were internal administrative documents relating to staff medical expenses, vacation and time off and vehicle certifications. When reached Friday, Gerardo Izzo, a spokesperson for the consul general in New York, said it is taking the matter “very seriously” but did not immediately have comment. Friday is a national holiday in Mexico. Alphabet’s subsidiary focused on urban tech development, Sidewalk Labs, is now trying to reinvent signage for smart cities. These signs aren’t to direct the flow of traffic, or to point the way to urban landmarks — they’re designed to let citizens know when they’re being monitored. The proposal is part of a push by the company to acclimate people to the technologies that it’s deploying in cities like New York and Toronto. Globally, competition for contracts to deploy sensors, data management, and predictive technologies in cities can run into the tens of millions, if not billions of dollars, and Sidewalk Labs knows this better than most. Because its projects are among the most ambitious deployments of sensing and networking technologies for smart cities, the company has also faced the most public criticism. So at least partially in an attempt to blunt attacks from critics, the company is proposing to make its surveillance and monitoring efforts more transparent. “Digital technology is all around us, but often invisible. Consider: on any one urban excursion (your commute, perhaps), you could encounter CCTVs, traffic cameras, transit card readers, bike lane counters, Wi-Fi access points, occupancy sensors that open doors — potentially all on the same block.” writes Jacqueline Lu, who’s title is “assistant director of the public realm” at Sidewalk Labs. Lu notes that while the technologies can be useful, there’s little transparency around the data these technologies are collecting, who the data is being collected by, and what the data is collected for. Cities like Boston and London already indicate when technology is being used in the urban environment, but Sidewalk Labs convened a group of designers and urban planners to come up with a system for signage that would make the technology being used even more public for citizens going about their day. Back in 2013, the U.S. Federal Trade Commission called for the development of these types of indicators when it issued a call for mobile privacy disclosures. But that seems to have resulted in companies just drafting reams of jargon-filled disclosures that obscured more than they revealed. At Sidewalk, the goal is transparency, say the authors of the company’s suggested plan. “We strongly believe that people should know how and why data is being collected and used in the public realm, and we also believe that design and technology can meaningfully facilitate this understanding. For these reasons, we embarked on a collaborative project to imagine what digital transparency in the public realm could be like,” writes Lu and her co-authors Principal Designer Patrick Keenan and Legal Associate Chelsey Colbert. As an example, Sidewalk showed off potential designs for signage that would alert people to the presence of the company’s Numina technology. That tech monitors traffic patterns by recording, anonymizing and transmitting data from sensors using digital recording and algorithmically enhanced software to track movement in an area. These sensors are installed on light poles and transmit data wirelessly. At the very least, the technology can’t be any worse than the innocuously intended cameras that are monitoring publicly spaces already (and can be turned into surveillance tools easily). 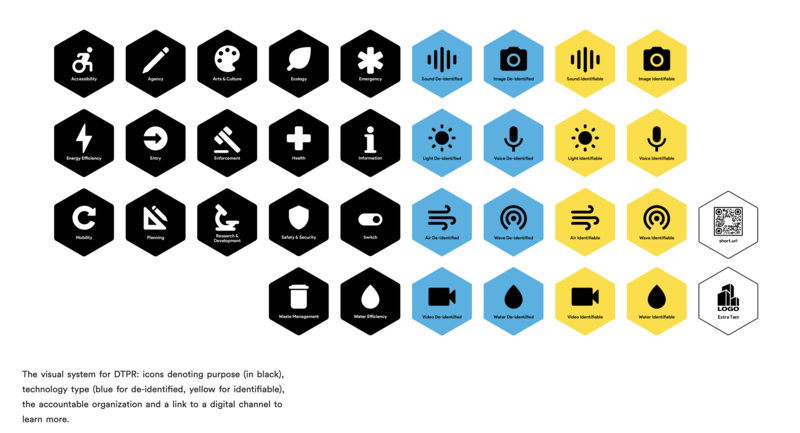 The hexagonal designs indicate the purpose of the technology, the company deploying it, the reason for its use, whether or not the tech is collecting sensitive information and a QR code that can be scanned to find out more information. The issue is with experiments like these in the public sphere is that there’s no easy way to opt out of them. 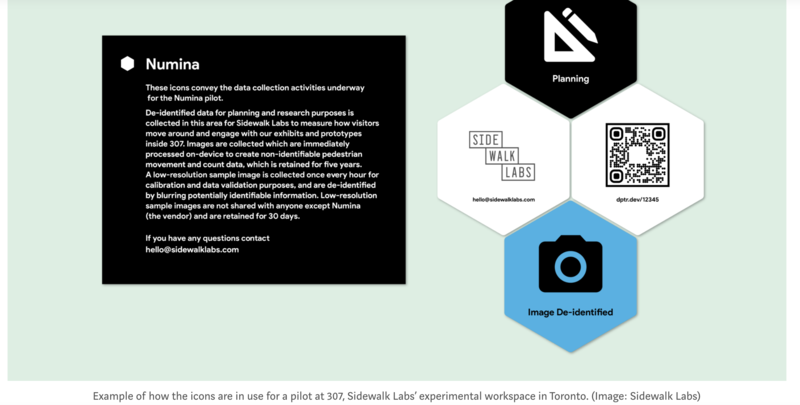 Sidewalk Lab’s Toronto project is both an astounding feat of design and the apotheosis of surveillance capitalism. Once these decisions are made to cede public space to the private sector, or sacrifice privacy for security (or simply better information about a location for the sake of convenience) they’re somewhat difficult to unwind. As with most of the salient issues with technology today, it’s about unintended consequences. Information about a technology’s deployment isn’t enough if the relevant parties haven’t thought through the ramifications of that technology’s use. Netflix is testing a new feature that can help you start streaming when you don’t know what to watch. The company confirmed it’s testing a shuffle mode of sorts, that will allow you to easily click on a popular show to start playing a random episode. The idea with the feature is to offer an experience that’s more like traditional TV — where you could just turn the set on, and there would be something to watch. With today’s streaming services, that sort of seamless experience is more difficult to achieve. Instead, viewers now have to first select a streaming app, then scroll through endless menus and recommendations before they can settle on their next title. The new shuffle feature, instead, offers something closer to the experience of turning on cable TV, when there was always some classic favorite show playing in syndication. The shows being tested with the new feature appear to be those that people choose when they don’t know what else to watch, like The Office, New Girl, Our Planet, Arrested Development and others. The Office, in particular, has a reputation for being a go-to pick for when you’re not in the middle of some other binge fest. The TV shows appear in a new row, titled “Play a Random Episode.” To get started, you’d click any TV show’s thumbnail, and a random episode from the series then starts playing. The thumbnails themselves are also adorned with a red “shuffle” icon to indicate they’ll play a random episode. Can Netflix and Hulu just add a shuffle button to tv series ? I know I want to watch the Office, but narrowing down the episode is just way to hard. The new feature was first spotted by the folks at Android Police, who saw the option appear in the Android version of Netflix’s app. Netflix confirmed to TechCrunch the shuffle feature is something it’s considering, but hasn’t yet committed to rolling out. “We are testing the ability for members to play a random episode from different TV series on the Android mobile app. These tests typically vary in length of time and by region, and may not become permanent,” a Netflix spokesperson said. Netflix for some time has been focused on ways to get users streaming its content faster, after they log in. That’s where it’s decision to run autoplaying trailers comes in, for example, or why it now features those Stories-inspired previews; or why it tested promoting its shows right on the login screen. Thursday was a big day for tech IPOs, with Zoom opening trading at $65 a share. The company’s initial public offering gave it a fully diluted market cap of roughly $16 billion. Meanwhile, Pinterest debuted on the New York Stock Exchange at $23.75 per share. At one point, the Russians used servers located in the U.S. to carry out the massive data exfiltration effort, the report says. Hiding Like counts could reduce the herd mentality, where people just Like what’s already got tons of Likes. It could also reduce the sense of competition. While the consumer version of BlackBerry Messenger is shutting down, the service will still exist. In fact, BlackBerry announced a plan to open its enterprise version to general consumers. Until this week, Echo owners who wanted to stream music from Amazon could either pay for an annual Prime membership in order to access Prime Music, or they could pay $3.99 per month to stream from Amazon Music Unlimited.